Microsoft's browsers last month continued their free fall, again shedding a significant amount of user share, an analytics company reported today. According to data from California-based Net Applications, the user share of Internet Explorer (IE) and Edge -- an estimate of the proportion of the world's personal computer owners who ran those browsers -- fell by nearly a full percentage point in May, ending at a combined 23.2%. May's decline was the largest since January, and could signal a resumption of the precipitous plunge IE and Edge experienced in 2016, when the browsers lost more than 22 percentage points, almost half their total share at the start of that year, and ceded the top spot to Google's Chrome. Microsoft's problem, as it has been since mid-2015, stemmed from two factors: A persistent decline in the demoted-to-legacy IE, which was expected after the launch of Windows 10, and the inability, to put it mildly, for Edge, 10's default browser, to make up the difference. The second was certainly not in Microsoft's projections. 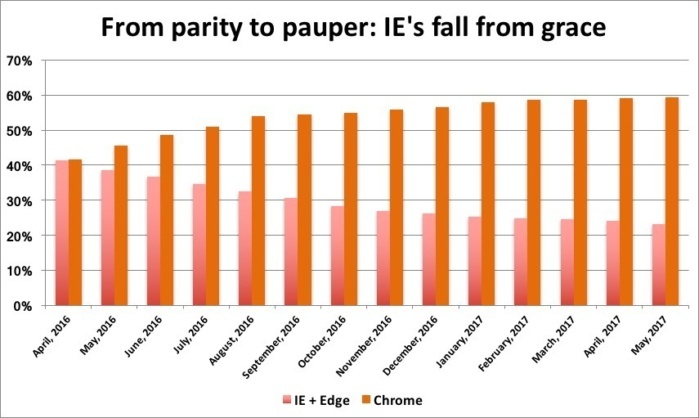 In the last 11 months, IE's share dropped by 41%, while Edge's increased by only 11%. On its own, IE has been under the 20% mark since January, and fell to a new low of 17.6% in May. Meanwhile, Edge stayed flat for the fourth month in a row at 5.6%. All of those ingredients cooked up a debacle. Although Microsoft has aggressively touted Edge, the effort has not yet paid off. Last month, just 21% of all Windows 10 users ran Edge as their primary browser, down from 29% a year earlier. Some analysts, however, expect Edge to turn toward a larger share of Windows 10 once enterprises seriously start migrating corporate PCs to the new OS, and, more importantly, when they divest themselves of the legacy web apps and intranet sites that require workers to run IE alongside a "modern" browser, like Edge. May's biggest beneficiary was Chrome, which added four-tenths of a percentage point to its user share, reaching a record 59.4%. Computerworld's forecast -- again using the trends in Net Applications' data -- puts Chrome over the 60% bar by August at the latest. Mozilla's Firefox, which in the first quarter of 2017 lost four-tenths of a percentage point, recouped half of that last month, climbing to 12%, its highest mark since December. Net Applications estimates user share by sniffing the browser agent strings of those who visit its clients' websites, then tallying the various browsers and operating systems. It also weights each country's data by the size of its online population to account for areas, such as China, where it lacks large numbers of analytics customers.